Why Eye Donation Our world is so beautiful, the mountains surrounded by greeneries, flowing river water gives a great pleasure to us. The beauty of the things around us fills the colour of joy and happiness in our life. All these beauty of life could be observed through eyes. Would you have ever thought that how the world will look without eyes. To observe this practically, just cover your eyes for two minutes, you will feel darkness throughout the world and the beauty of world will be useless for you. But there are such people in large number throughout the world, having only darkness in their lives; we name them as blind people. Among these blind people, there are such 50 lakh people, whose live could be enlightened only by the cornea through eye donation. 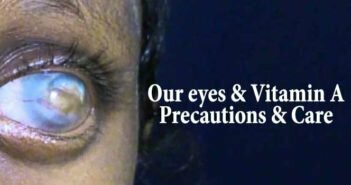 However, it is not very hard to get cornea through eye donation, the only thing required is to make efforts to develop awareness among people in this direction. An estimated 5 million people are suffering from corneal blindness and a huge gap remains between supply and demand of eyes; supply being less then 10 percent of the demand. Amidst such situation, awareness of masses regarding the blindness and eye donation becomes prerequisite of a healthy society. Lets make it habit, donate EYEs. There is lots of problems in terms of corneal blindness in India. By getting cornea transplanted a blind person can get his eye-sight back. The process of transplanted means, getting the cornea from a deceased person and later transplanting the same to a blind person. The success rate of this transplantation process is 50%. Which means if we want to give eye sight to one lakh people we will require nearly 2 lakh cornea. Last year 50 thousand cornea were donated and around 20 thousand operations took place in entire India. The figures are far too less in terms of seeing the long queue of the blind people. There is shortage of cornea in our country and in such condition, a blind person sometimes wait entire life for getting the cornea. Eye donation is only done after death and at that moment the body is not alive. The operation is very critical and the eye-lid are closed. Only the cornea is taken out from the body not the eyes. In India its not important for a person to sign the eye donation form while he/she is alive but their close relatives can also fill and sign the form. People can inform their close relatives while they are alive that they want to donate their eyes. Follow the link to learn more about eye donation. In view of the above situation we at Antardrishti initiated The Drishti Creative Contest in 2011 with the purpose of spreading awareness and involving the youth in this process. Every year, the contest witnesses enthusiastic participation from all over the country. 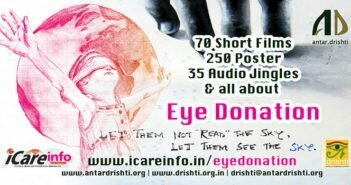 So far we have collected more then 1200 Eye Donation Short Film, Poster, Audio Jingles to promote Eye Donation.